I'm starting to wind down for Christmas and have been looking for fun but untaxing ways to relax in the evenings. 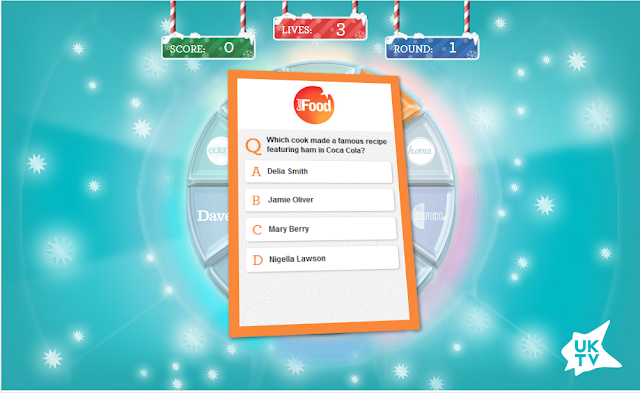 This fun UKTV online festive quiz has kept me entertained these last few nights as I guzzle some of the home-brewed Sloe Gin and munch on a mince pie. If you fancy yourself as a bit of a TV buff then why not give it a whirl. All you have to do is to spin the wheel to select one of the UKTV channels and then you are faced with a question topical to that TV channel. On the Good Food channel you might be presented with a question about your favourite celebrity chef. On Dave you might be challenged to answer a question about a classic comedy series. For Home you might have to answer a general knowledge question about the home or garden. For each channel that the spinner lands on, you can choose to answer a hard question, an easy question or one in the middle.- you get more points for the more challenging questions. There is no grand prize but trust me, you'll find the challenge addictive. My knowledge of TV drama is a bit ropey so I've not got much further than round 9 but if I get a series of questions from Dave then I'm well ahead on the score. You get three lives each time you play the game and the aim is not only to get as high a score as you can manage, but also to try and survive a question from every single segment on the wheel. If you're looking for a fun way to test your TV trivia this Christmas then why not try playing the UKTV Christmas quiz with your friends and family and see who gets the highest score? Disclosure: I was offered a small incentive for sharing this quiz... but it is fun, and I've enjoyed playing it. Now I'm off to beat my high score.